During the past few weeks the Augur product, design, and dev teams all came together to work on the 2nd sprint of our new 2-week development cycle: Belligerent Banana. During this sprint the teams closed a combined 67+ issues spanning 3 repositories! Continuing with the three major initiatives team members worked on the designing updated portfolio, account, and reporting views; implementing those designs on the front end; and building new middleware and backend infrastructure, along with v2 contracts. The current sprint, Cantankerous Cabbage, continues to build on this work. The design team gained a new member, Cillian Hunter, who will be helping on all aspects of product and visual design. The larger team has been working on mobile-focused visual design for all new pages on the reference UI — focusing on the Portfolio and Accounts views — and bringing that work back into the upcoming trading page. This work is being done in concert with the development team to iterate quickly and create a detailed and usable reference UI. In parallel, the team has been researching what is needed to improve the experience of the market reporting flows leading up to the reporting redesign project; which will begin in earnest during the upcoming sprint, Diabolical Dewberry. The UI team absolutely flew through issues during the last sprint! They got nearly every feature complete on the upcoming new portfolio view and account summaries. 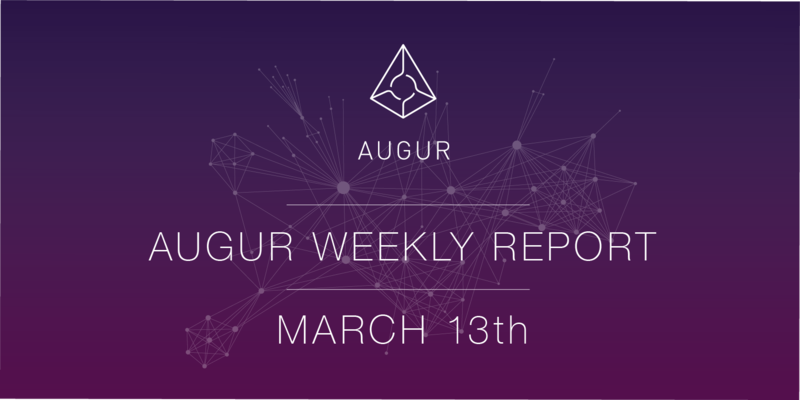 These new views bring everything you need to trade on Augur markets into one place; including a totally redesigned notifications section which makes it easy to claim fees, claim proceeds, track unsigned orders, and more. All of this is being done while working toward a lovely component-based framework that can be used to build other rich UIs for Augur quickly. The middleware and contracts team has been diligently working on a variety of aspects of improving data syncing, including performance testing our newly designed synchronization algorithm against a variety of Ethereum nodes and providers. The team found major improvements in overall speed of retrieving data with simple tweaks like making sure Ethereum nodes serve data gzipped over HTTP. Unfortunately, all tests still point to poor performance when fetching many blocks worth of logs from light clients, showing response times of 8–10x that of an average full node. More will will be done to optimize this case in the future. The contracts have received significant work over the last couple weeks as well, including support for “K.Y.C.”d order books, and support for paying for transactions with DAI. Through this sprint the team will be working on implementing an important new feature, a recurring market to act as a REP price feed. It is expected that all major feature work for the contracts will be completed in its first phase over the next few weeks, where the team will begin to start supporting integration work for the middleware team. If you’re interested in seeing the work that is completed during this sprint please check out the current milestone, Cantankerous Cabbage.